Please don't leave your pets in cars! It’s been one year, exactly, since Ottawa Sun reporter Doug Hempstead spent 20 minutes in his car in sweltering heat to prove a point – that cars are no place to leave your pets in hot summer weather. Dogs don’t sweat. Instead, they cool themselves by taking in oxygen when they pant. If the air they are breathing is over 40 C, they have no way of cooling themselves. Their normal body temperature is about 39 C, and temperatures over 40 C can cause them irreparable brain damage or death. Leaving the windows open slightly doesn’t do a lot to change the temperature in the vehicle. Each year the OHS takes hundreds of calls about dogs left in vehicles on hot summer days. A car parked on a hot day, even in the shade, can quickly become a furnace. Owners leaving an animal in a vehicle can be charged under the Ontario SPCA Act. Investigators have the authority of a police officer when enforcing these laws. The Act permits the investigator to issue a written order to the owner of the animal or to take the necessary steps to relieve the animal from distress. 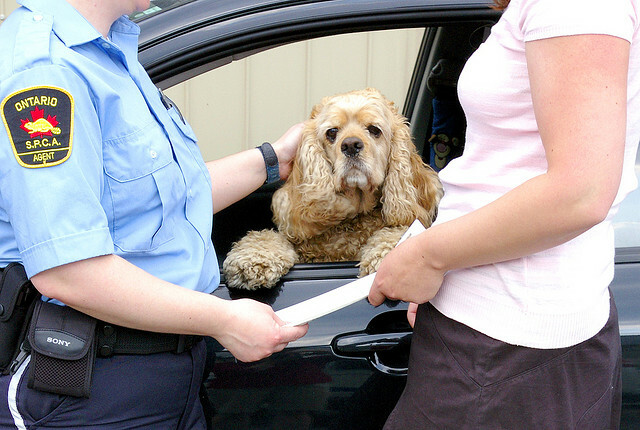 Non-compliance of an OSPCA order may result in the animal being removed from private property (including parked vehicles). When a heat advisory is issued, it applies to animals, not just people. The older or more vulnerable the animal, the more susceptible they are to heatstroke... or worse. If you see an animal that may be suffering from heat exhaustion, and the owner can’t be quickly located, enlist the help of a parking attendant, security guard or nearby police officer, or call the OHS at 613-725-1532. If you missed the 20-minute docu-drama that Doug Hempstead filmed this time last year, or you want to see it again, click here!